ATL Dunbar over the years has developed a reputation as a leading manufacturer of technically exceptional form, fill and seal polythene films. With the capability to meet any specification demand of FFS film from mono to co-extrusion, Our FFS customer base is one of the largest in the UK and extends into every industry where there is a polythene requirement to be met. From aggregates, chemicals, granules, polymers and fertilisers right through to the food and drink industry, We lead the way in terms of technological innovation, processing efficiency, cost effectiveness and customer service. We work alongside all of our customers to ensure that film that is optimised for them based on the latest machine and polymer technologies available. 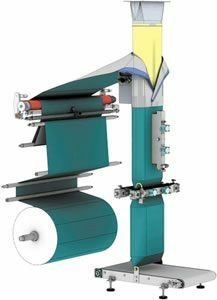 Every extruder at our extrusion facility is fitted with in-line printing presses capable of printing simple 1 or 2 colour designs such as company logos or warning notices that offer a cost effective print option. On-site we also have a print shop that houses our reel to reel printing presses capable of printing complex designs of company and product branding of up to 6 colours. Any print requirements greater than 6 colours or process print is cost effectively contracted out to trusted and capable print partners Elite Plastics. Anti-Static, Flame Retardent, High/Low Slip Level, UV Inhibitor, Corrosion Preventative etc.